Zebra Print Maxi Shirt Dress is rated 4.0 out of 5 by 7. 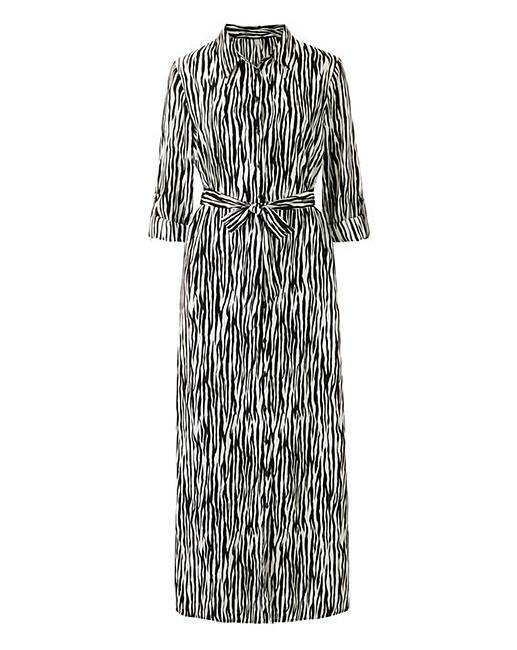 This maxi shirt dress comes in zebra print for the new season. Featuring long sleeves that have a turn up button fastening to give a three quarter length sleeve and a tie waist, this maxi shirt dress can be worn buttoned fully for day wear, or part way to create a going out look. Rated 3 out of 5 by Angelnc from Lovely dress I bought this looking at the photo which makes it black with white stripes but when I received it, it was a mainly white dress with black stripes. I liked it but not for me. Rated 5 out of 5 by beck from A dress for all seasons :) Adore this dress, flattering as it clinches in at the waist. Light weight, works well if you are tall. True to size. Very Chic.